If you want to make this dish suitable for vegetarians, omit the prawns. Instead, briefly fry the garlic and chilli, infusing the lemon zest in the rest of the oil. Reduce the heat and add the lemony oil to the garlic and chilli in the pan. 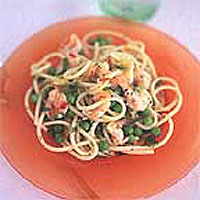 When hot, add the whole lot to the pasta and peas with the parsley and lemon juice. You could scatter a little crumbled Feta cheese over the finished dish as well, if you like. Clean the prawns by peeling off their shells and cutting them in half lengthwise. Pull out and discard the black digestive threads from the prawns, if they have any. Mix the prawns with 3 tbsp of the olive oil, along with the chopped garlic and the chilli. Season with salt and freshly ground black pepper and set aside to marinate. Pour the remaining olive oil into a separate bowl and add the finely grated lemon zest. Bring a large pan of water to the boil, salt well, then drop in the spaghetti. As soon as it returns to the boil, cook for about 10 minutes before adding the petits pois. Return to the boil and cook for 2-3 minutes or until the spaghetti is al dente and the peas are just cooked. Drain the pasta and the peas in a colander. Meanwhile, as soon as you have added the pasta to the water, set a non-stick frying pan over a high heat. Add half the marinated prawns and stir-fry briskly for 2-3 minutes or until they are pink. Tip the cooked prawns into a bowl and return the frying pan to a high heat. Add the remaining marinated prawns and cook in the same way. When the prawns are cooked, turn the heat to low and return the other cooked prawns, with the chilli and garlic, to the pan, along with the extra lemon oil and parsley. As soon as everything is hot, mix the contents of the pan into the drained pasta and peas, along with the juice of one lemon. Season to taste and serve straight away.